The last time I saw this movie, before watching it for this review, was the night it opened at the Angelika on Houston St. in 1999. That was my first summer in New York City. I was young, poor, and my eyes still boggled at the sights of the big city. The future was so bright that I didn’t mind the cumulative petty annoyances that make living in a city a daily trial. I was hooked. I was in love. I didn’t mind that with the bright lights and creative people came a dastardly assault on the senses. The piercing screech of a 6 train entering Union Square was just a touch of realism, even as blood trickled from my ruptured ear drums. The sweltering summer heat cooking a bouquet of urine and dead fish from the city’s sidewalks was a small price to pay for urban dynamism. A strong scent is the mark of a people’s presence, and there can’t be a great city without lots and lots of people. I remember opening night being an event. I had a roommate at the time, Matt, who was into horror flicks in a big way. As much as I was a fan even then, he was the person who introduced me to the work of Dario Argento and made me reconsider my opinions on George Romero. He was an advocate for the early works of Bob Clark and Tobe Hooper. It was my roommate who had an entire bookshelf of horror movies on VHS. There were titles I’d never heard of. Some good, some awful. Children Shouldn’t Play with Dead Things, Phenomena, The Toolbox Murders, Deathdream. He had stacks of Fangoria in his bedroom, and an autographed picture of Gunnar Hansen hanging on the wall. When the viral marketing campaign for The Blair Witch Project began, Matt’s excitement was palpable. He devoured every little tidbit he could find. He frequented the local library branch to get a little internet time, exploring all the various websites that had been set up surrounding the film. There was a lot of hype in the apartment that season. To be clear, neither he nor I fell into the trap of believing the film was real. I was stunned back then that anyone thought it was real. But then again, Matt had all those magazines, inside which were interviews with the film’s directors, Eduardo Sanchez and Daniel Myrick. For anyone with more than a casual appreciation of horror flicks, the curtain was pulled back well before opening night. And what a night. The line to the ticket window at the Angelika stretched halfway up Mercer towards Bleecker. Inside, the lobby was packed, the line snaking by a display with artifacts supposedly recovered from the woods where the film was discovered. Hmm, time to delve into the plot a little. The Blair Witch Project is a found footage horror flick; just about the most overdone technique in horror, to the point it’s a scourge on the genre. This film wasn’t the first to use the technique, but its success precipitated an explosion of found footage flicks. 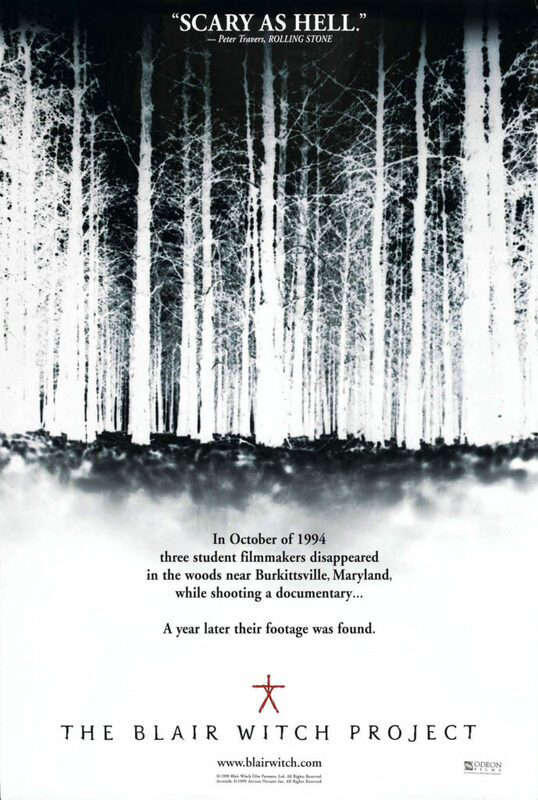 The story, as cooked up by the filmmakers, is that in 1994, a small group of aspiring filmmakers set out to make a documentary on the Blair Witch, a legendary woodland spook in rural Maryland. The three young folk disappeared, but their cameras, footage intact, were discovered and what they shot assembled into this film. What made this film unique is that, for the most part, the filmmakers and the distributors kept up the illusion that the film was real. They were playing a part just as crucial to the film’s success as the cast members, and it worked. That display in the Angelika was a hell of a touch. So, the anticipation was great. Both Matt and I wanted very badly to see this great, new, revolutionary entry into a genre of film that we both love. Too bad it fell flat. The Blair Witch Project hasn’t received universal praise, but it has been overrated. What I saw in that theater in 1999, and again last night, was a film consisting of weak set pieces strung together with little narrative. The improvisational skills of the cast (Heather Donahue, Joshua Leonard, and Michael C. Williams) was put to the test. They did all right with the material, but there wasn’t much material to work with. Both cast and audience were supposed to be frightened by nighttime noises in the woods and stacks of rocks. Rather than a horror flick, what we get is a film of three Gen X-ers lost in the woods and bitching about running out of smokes. There’s no there, there. The film ends with a flurry, but denouement still left me scratching my head. Not at the outcome of the film. I couldn’t see how the film could be saved after so much nothing. Rather, I was very surprised that so many people not only liked this film, but found it quite frightening. Some people had their pants scared off by this flick. Matt and I were not among their number. He was dead silent when we left the theater. He had this blank look on his face. I remember watching him as we were going up the escalator to the exit, thinking it had been awhile since I had seen anyone this deeply unhappy. Outside on the street, he pronounced the film a dull, boring affair. I agreed. But the wounds were deeper for Matt, I think. All that hype, all that anticipation; I think maybe he felt like he had been suckered. We never spoke of The Blair Witch Project again.